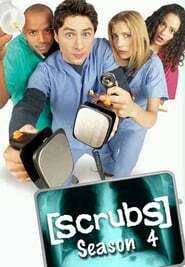 The fourth season of the American comedy-drama television series Scrubs premiered on NBC on August 31, 2004 and concluded on May 10, 2005 and consists of 25 episodes. Heather Graham guest starred for an extended run for the first 8 episodes, and then another appearance later in the season. Colin Farrell, Matthew Perry, Molly Shannon, Clay Aiken, and Tara Reid guest starred. This season was nominated for the Primetime Emmy Award for Outstanding Comedy Series.